H7576 Wood & Hughes Aesthetic Sterling Bowl 9"
An aesthetic parcel gilded sterling silver bowl on a low pedestal by Wood & Hughes with ruffled edge and acid etched and engraved roses, rose buds, leaves and stems on a stippled background in the interior of the bowl. A rectangular cartouche in the center bears a monogram. Diameter 9"; height 2 1/2"; weight 15.20 troy oz. Excellent condition. A pair of Kalo oval form sterling hand wrought bowls with applied rim at the base and around the top edge. Length 8 1/4" by 5 1/8" wide. 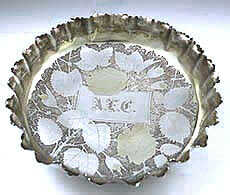 Both bowls are marked with style number V1B and have script monograms ENB on one side. Combined weight 22.25 troy oz. 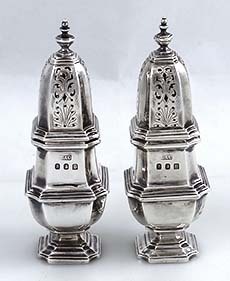 A fine quality heavy English Britannia standard silver (950 pure) salt and pepper set by Crichton Bros dated for London 1933. Height 4 1/2"; total weight 11.25 troy oz. Also marked on the base Crichton & Co. Excellent condition and monogrammed as shown. 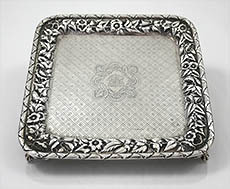 A Kirk Repousse sterling silver sideboard dish with 2 1/2" border depicting flowers and grapes on a stippled background. The center field is plain and has never been monogrammed. Total diameter 15"; diameter of center field 9 1/4" and 3/4" deep; weight 48 troy oz. 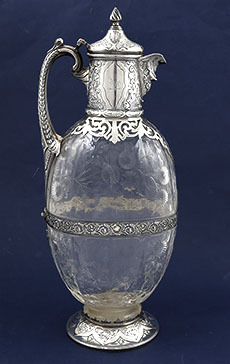 An exceptional English silver and rock crystal wine carafe with sterling mounts, the crystal with etched floral decoration probably by Stevens and Williams. Hallmarked for London and dated 1888. Crested one one side and monogrammed on the other. Excellent condition. 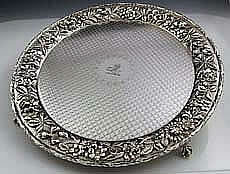 An engraved footed oval coin silver salver by Theodore Evans of New York in pristine condition. The engraving is a combination of bright cut and engine turning. Weight 6.5 troy ounces. Length 7 1/4" by 5 1/2". Presentation inscription in the center cartouche. A sterling silver footed vase with two applied handles by S Kirk & Son in the Landscape/Castle pattern depicting a castle on one side and Chinese style building and trees on the other as well as flowers and leaves on the body. Height to the top of the handle 12"; height to the top opening 10"; diameter at top 4"; diameter of base 5". Marked S Kirk & Son Co., 925/1000, 1. Excellent condition with no dents or damage or repairs and never monogrammed. Weight 39.6 troy oz. Height: 13" Weight: 71 troy oz. Width: 14 1/2" across the handles. 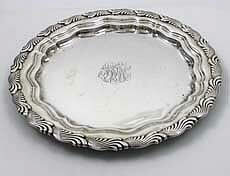 A large impressive sterling silver antique salver by S Kirk with 11 ounce mark and empty cartouche. Diameter 14". Weight 37.45 troy ounces. 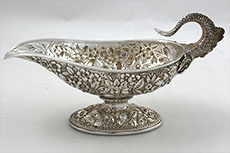 An A Jacobi hand chased antique sterling sauce-boat with a cast applied fish handle in excellent condition. On a repousse pedestal base. Weight 13 troy ounces. 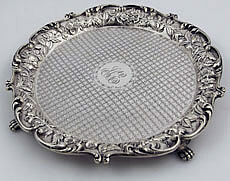 Length 7"
A good quality antique coin silver salver by Gorham retailed by George Webb and Co. circa 18690. Four mounted button feet ancd engraved decoration around a large cartouche bearing a monogram. Applied border. 12" by 9". 17.35 troy ounces. 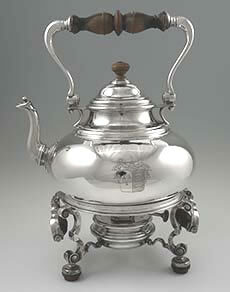 A sterling silver kettle on a stand with wood handles and finial, pull off lid and crest on the front. 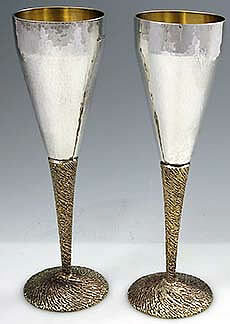 The maker is Sebastian Garrard of London and dates to1931. The burner is built into the stand and unscrews from the top. Height 14" with the handle and 11 1/2" to the finial; width 9" Weight 101 troy oz including wood. 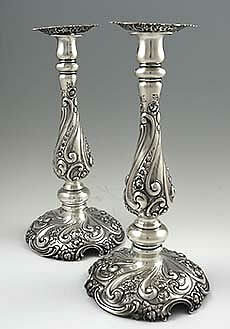 A lovely pair of sterling hand chased weighted Shreve candlesticks with a nice height of 11 1/2" in perfect condition. The columns are weighted but the pedestal is open and not weighted. Fine quality by a great maker in San Francisco. A heavy good quality Irish silver creamer by West & Sons, Dublin 1898, figural Chinoiserie style with lion faces on the paw feet. Height at spout 4 3/4"; weight 8.30 troy oz. Crest in the cartouche. 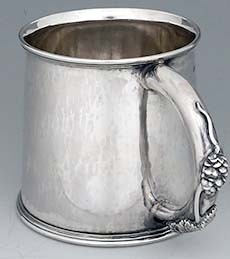 An English silver flare form hand hammered cup by Charles Boyton, the handle with applied leaf and grapes. Hallmarked for London 1948. Height 4"; diameter at the top 3 1/2" and base 4" in diameter. Weight 14.60 troy oz. A rare and unusual large American sterling cooking saucepan by Adelphi with applied handle and presentation inscription on the front dated 1857 to 1908 to The Mander Bros. Length with handle 13"; diameter 7"; height 4 1/2"; weight 22.60 troy oz. A tall weighted 17" tall vase with chrysanthemum terminal and applied leaves on the stem. 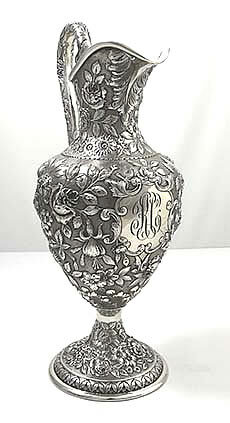 The antique sterling vase circa 1890 is monogrammed and can contain one or two tall flowers in the narrow neck. A delicate item retailed by a quality store in New York. A four inch tall Tiffany plain castor with the mark for 1907-1938 in excellent condition without monograms. Weight 2.8 troy ounces. This is a copy of an original made in the 1700s in Boston. 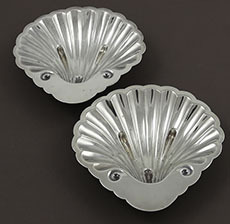 A pair of Kirk sterling silver dishes in the form of shells. Length 5" by 5". Marked S Kirk & Son Inc., sterling, 402. Combined weight 6.75 troy oz. 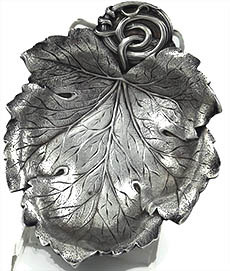 A heavy cast antique sterling silver leaf form dish measuring 7" by 5 1/2" with a weight of 11.2 troy ounces. Dated 1928 with a year code. Excellent condition. 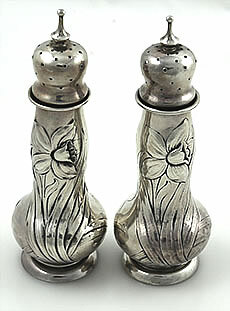 A Gorham sterling silver salt and pepper set with chased and hammered flowers and leaves. Height 5 1/5" to the top of the finials. Weight combined 4.15 troy ounces. Marked with the date letter M for 1880. 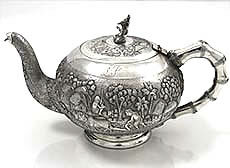 A quality Indian silver teapot with exceptional chasing of huts and farming with palm and other trees finely chased against a textured stippled background. The handle is bamboo shaped and the hinged lid has an Indian god as a finial. 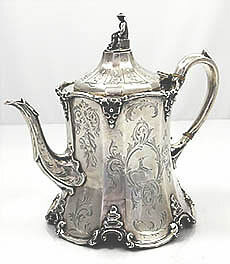 The spout is finely chased and detailed. Lightly monogrammed. Length 9". Height 5". Weight 21.5 troy ounces. 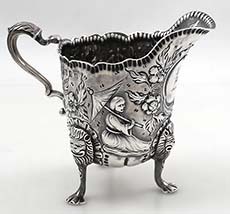 A Tiffany sterling water pitcher on a rectangular base with applied flowers around the body and on the handle as well as chased decoration on the top and bottom half of the pitcher. Monogrammed on the front. Height 8 3/4"; weight 32 troy ounces. Excellent condition. 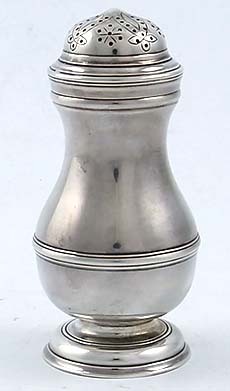 A William Forbes coin silver pitcher dated with an 1857 railroad inscription in script engraving. the chasing of flowers and leaves with engraved branches is extremely fine and extends to the pedestal base. Marked with the retailer Ball Black of New York on the base in addition to WF. Height 12". Weight 40.25 troy ounces. 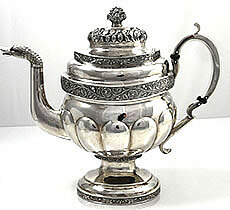 An enormous American coin silver teapot in superb condition with hand chased decoration on a hand hammered surface. The spout has a duck head terminal and the finial is a basket of flowers. The manufacturer is Garrett Eoff, marked on the pedestal base. Active 1779 to 1845. Holds 10 cups. Small script monogram on one side only. 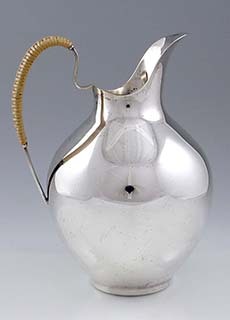 A tall heavy hand chased sterling silver ewer by A G Schultz of Baltimore, Md. 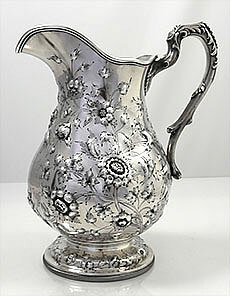 The entire pitcher including the handle hand chased with various flowers against a background of fine stippling. The pedestal base has a hand chased border of inverted leaves. Crisp sharp condition with minimal wear. Monogrammed in the cartouche on the front. A Stuart Devlin sterling silver goblet dated 1978 in the original fitted box complete with key. 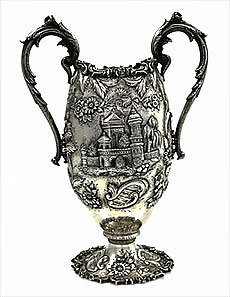 The sterling goblet is in the grape pattern with a gilted stem showing clusters of cast grapes at the top. Gilded interior. Excellent condition. Height: 6 7/8". Stuart Devlin was an important manufacturer in London now living in Australia. He manufactured silverware for royalty and other important patrons including Princess Margaret. 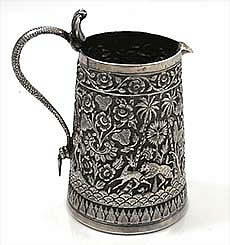 A superb antique silver milk pitcher from the Kutch region of India with remarkable tight detailed chasing depicting animals and trees with chased decorative bands on the borders. The handle is an applied cobra snake. A hand engraved peacock crest on the base and the mark "sterling silver". Height 5 1/4" to the top of the handle. Weight 10.8 troy ounces. 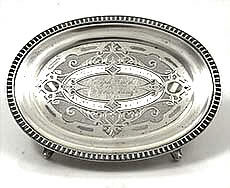 A square antique sterling footed salver retailed by Caldwell and manufactured by Krider of Philadelphia. The border hand chased with leaves and flowers and the mid section engraved with a diapered pattern. Monogrammed at the center in a cartouche surrounded by a floral wreath. Ball and Claw applied cast feet. 8" square. 13.40 troy ounces. 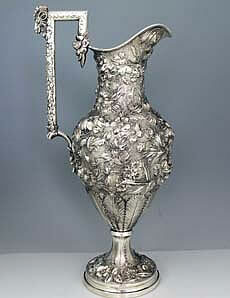 A tall finely chased ewer by Jenkins and Jenkins of Baltimore. The body chased with large leaves and finely chased with flowers and leaves throughout. The ornate handle has a three dimensional ram on the top in addition to hand chased flowers on the handle. Extremely fine work. Measures 16 1/4" at the handle. 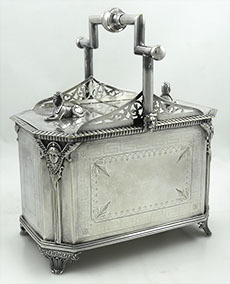 A rare antique novelty silver plated double biscuit box with a divider in the center and two hinged lids surmounted by Egyptian sphinx figures as finials and applied handle with medallion on each corner. Engraved Greek key decoration and other engraving on the body and lids. 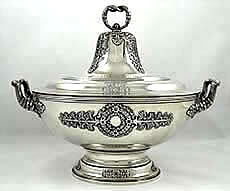 Maker: Albert J Beardshaw & Co., Sheffield, circa 1876. Length 8 1/2" by 5"; height 10 1/2" to top of handle. Excellent condition. The number on the bottom indicates a museum de-acquisition. 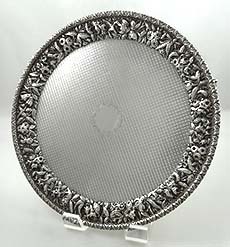 Ten individual Gorham sterling nut baskets with pierced sides. Length 3 7/8". A large impressive lightly gilded 800 silver cup by Schmedding of Augsburg, Germany set with four amethyst stones on the octagonal body. Engraved and decorated with panels of stippling alternating with plain surfaces and measuring a whopping 11" tall. The diameter of the top is 4 3/4". Marked on the base with maker, city (Augsburg) and 800 with half moon and crown. 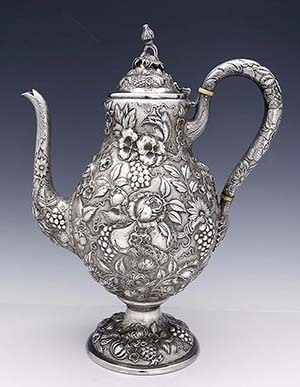 A huge antique sterling repousse tea pot chased with grapes, pears together with roses and strawberries in crisp high relief detail against a finely stippled background. The pot is in pristine unpolished condition and measures 13" tall. Mark of Loring Andrews Cincinnati Ohio. 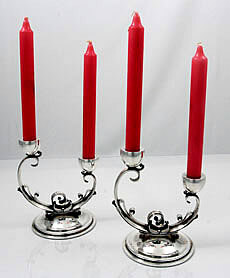 A pair of two arm candlesticks by the Danish silversmith Rasmussen, all solid sterling without being weighted and in a smart modern design. Weight: 34 troy ounces. 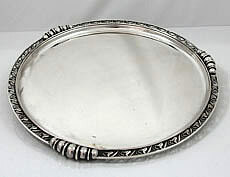 Height: 6 3/4"
A large circular sterling tray by La Paglia for the International Silver Company with a 17" diameter and a weight of 64 troy ounces. Never monogrammed. 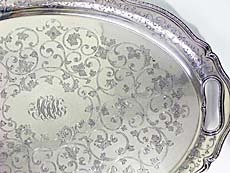 An antique sterling silver salver by S Kirk and Son with a hand engraved diapered center and chased floral border. Four cast ball and claw feet. Crest engraved in the central cartouche. Rope edge border. 12" diameter. Weight: 24.25 troy ounces. Crisp sharp condition with perfect color. 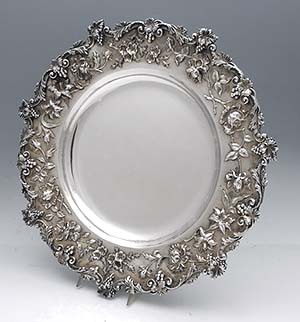 An 8" diameter antique sterling silver salver by Kirk and Sons of Baltimore Maryland with a hand chased floral border and engraved diapered plateau. Monogrammed in the central cartouche with script monogram. Weight: 9.2 troy ounces. A large hand engraved teapot by William Smily dated and hallmarked London 1858. The finial held in place with the original nut inside the lid is a Chinese figure holding a pipe. Crest engraved in the cartouche on one side. 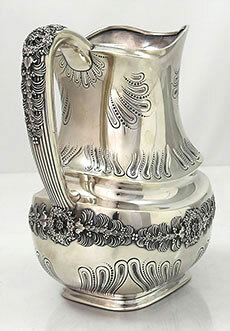 A stylish modern 1960s sterling silver bar pitcher by the International Company. The body is completely plain without ever having been monogrammed and the handle has is wrapped in a plastic strip in the style of woven wicker. Excellent condition. 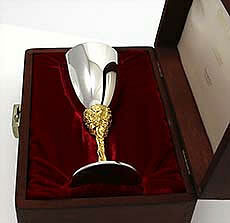 These are indeed the antiques of tomorrow and have found a place in the world of collectors. Height: 8". Weight: 15.25 troy ounces. 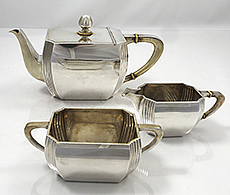 A smart Austrian silver art deco tea set comprising a large tea pot and sugar and creamer. The set has never been monogrammed and is plain with the exception of the fluted art deco lines on the corners of each piece. Weight: 45.6 troy ounces combined. Diana head hallmark. Maker VCD. Pot ht 6", 11 1/4" across by 4 3/4". sugar & creamer ht: 2 3/4".